Colombo : Sri Lankan President Maithripala Sirisena on Monday said he is opposed to forming a national government only to expand the Cabinet of ministers, indicating that his rift with Prime Minister Ranil Wickremesinghe was far from over. Prime Minister Wickremesinghe-led government on Friday sought the consent of the Speaker of Sri Lanka’s Parliament to form a ‘national government’, a move seen as a step to get a majority in the 225-member House. Addressing the nation at the 71st National Independence Day celebrations, Sirisena said the proposed national government is simply an attempt to increase the number of Cabinet ministers and provide privileges to the ministers at the people’s expense. Calling the move unethical, the president said the people’s wish is to limit the Cabinet to 25 ministers. “I have seen media reports of an attempt to form a national government. I stand opposed to the move as this would be an exercise only to expand the cabinet of ministers and attain more privileges,” Sirisena said referring to the move by Wickremesinghe. Wickremesinghe was sacked by President Maithripala Sirisena in October last year and strongman Mahinda Rajapaksa was appointed the prime minister. 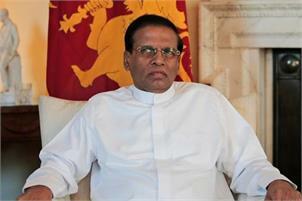 The President also removed the members of his Sri Lanka Freedom Party (SLFP) from the national unity government. The UNP, with 106 seats, had joined hands with the Sirisena’s SLFP in 2015 to form a unity government. Sirisena was forced to reappoint Wickremesinghe as the prime minister after Rajapaksa failed to prove his majority twice in Parliament. Since his reappointment in December last, the Wickremesinghe-led government has been functioning without the required majority of 113 in the 225-member House. Sirisena’s move to dissolve Parliament to hold a snap parliamentary poll on January 5 was turned down by the Supreme Court. Wickremesinghe plans to set up a national government by entering into a pact with the solitary member from the Sri Lanka Muslim Congress while roping in the members from Sirisena’s Freedom Party. The year 2019 is a crucial year for Sri Lanka as the next presidential election is scheduled to be held between November this year and early January 2020. Wickremesinghe’s party has already announced that they would not back the president again due to the ongoing rift between Sirisena and Wickremesinghe. Rajapaksa cannot contest again as he had been twice president before. The former President’s new Sri Lanka People’s Party is less inclined to back Sirisena. The Rajapaksa-led opposition has been demanding holding of fresh elections ahead of its schedule in August 2020. During the address, Sirisena also warned that international forces were working against Sri Lanka in this election year. He said international reactionary forces have arrived in the country in various disguises. He also lamented that even after 71 years of independence the main national question regarding the Tamil minority still remains unresolved. Interestingly only last week that Sirisena publicly opposed the ongoing attempts to form a new Constitution aimed at addressing the issues of the Tamil community.